One of the joys of living in a city like Philadelphia is the great “Sunday Funday.” Getting together with friends, bopping around town without a set plan and treating the last day of the weekend like it’s a Friday night. First, some brunch with Bloody Mary’s at a restaurant celebrating the 5k we ran in the morning, then watching some afternoon football or baseball at a bar or two, next a restaurant for dinner and drinks and finally another bar or two for a nightcap enjoying the sunset (or snowstorm) on the way home. While it’s a wonderful way to enjoy (or waste, depending on your outlook on things) the day, it can also take a huge toll on your wallet. Those mimosas and craft beers sure can add up. 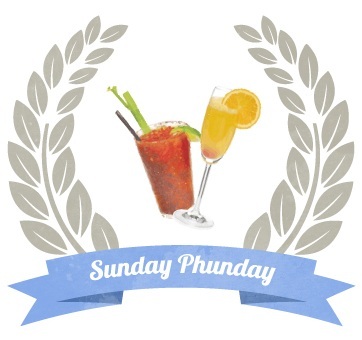 Fear not, Sunday Phunday’ers, we got you covered. Welcome to our 2nd Annual Philly Sunday Funday locator, detailing as many drink specials on Sundays as we can find! This year, we’re new and improved with a much more mobile-friendly interface. Do you know what bars have bottomless mimosas and Bloody Mary deals? Prefer a Sunday beer deal? What bars have Sunday evening happy hours? Maybe you know your local brunch places, but you have reason to be in a different part of town? Well, next time someone interrupts your Sunday Funday by asking The Question (“Where to next?”), you’ll know where to recommend. So get the Hollandaise sauce ready for your eggs Benedict, shake up that the hot sauce for your breakfast burritos, and most importantly, bookmark this post and share this link with you Philly friends, because here is the new-and-improved, mobile-friendly, Sunday drink special locator you’ve been waiting for: The Official Sunday Funday Locator for Philadelphia Phunday’ers. We’ll be updating every so often. Here’s to some great Sunday Fundays, Philly Peeps! Cheers!